The huge and varied wares of La Fugitiva make it a treasure trove of delights and will draw you in until suddenly you’ll notice you’ve spent a whole hour rummaging around! 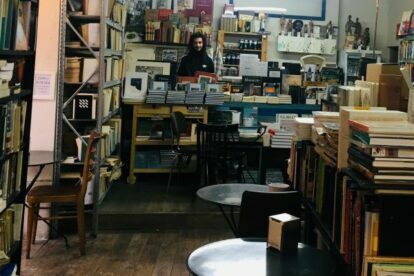 Time flies when you are leafing through old volumes… Madrid is well-served when it comes to second-hand bookshops, but La Fugitiva feels extra-special to me. In addition to books, including some in other languages, they also sell old vinyl, street maps, photographs and other assorted bric-a-brac. I never leave without making a great find – last time it was a Minnie Riperton LP, Inside my Love from 1975 in almost mint condition – shame I don’t have a record player! There is something for everyone. Another great thing about La Fugitiva is that you can have a coffee or drink there and hang out peacefully for ages – it’s a great meeting place. A bit like a library where you can talk and buy the books! If you are in the area check out some others spots, the nearby Cine Doré as well as the very popular La Sanabresa.